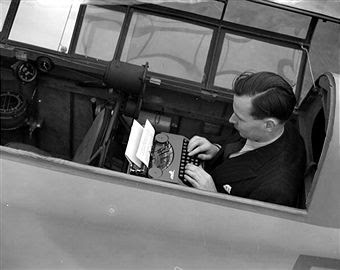 London Daily Express air correspondent Victor Anthony Ricketts, a lion-badged Empire Aristocrat portable typewriter on his lap, tests out elbow room for typing in the cockpit of the de Havilland DH88 Comet in which he and New Zealand-born pilot, Flying Officer (later Air Commodore) Arthur Edmond Clouston smashed 11 world records on round-the-world flights in March 1938. 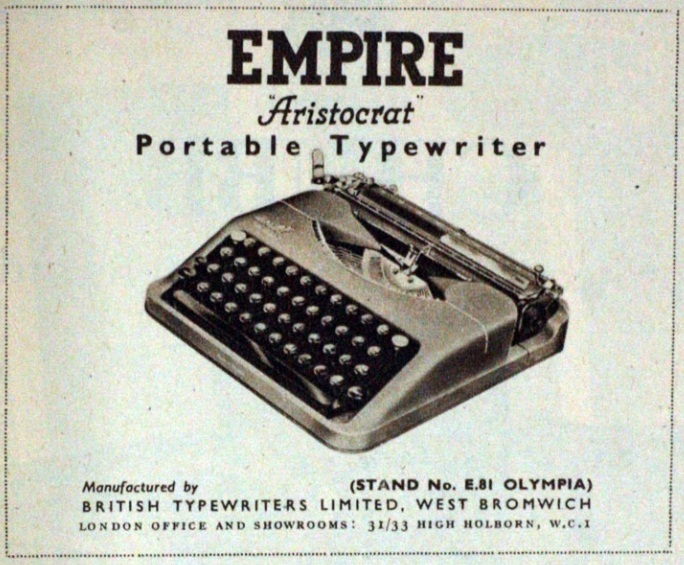 Rickett’s Empire Aristocrat was made by the British Typewriter Company of Queen Street, West Bromwich, outside Birmingham, England, under a 1935 license from E.Paillard and Company of Yverdon, Switzerland (the Empire Aristocrat being made from the design for the Hermes Featherweight, above left, as on Ricketts’ model, and later the Hermes Baby/Rocket; advertisement below). 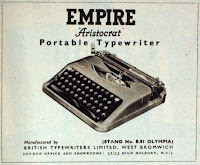 Ricketts, who wrote for the Express under the byline of “Cygnus”, had approached Clouston with a deal: If Ricketts could raise the money for the world record attempts, would Clouston fly the plane and take Ricketts along with him as a typewriter-wielding second pilot? Clouston, who had been a test pilot for the Comet, agreed. 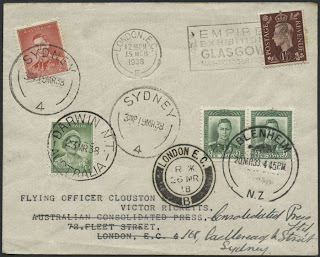 Ricketts and Clouston flew from Gravesend, Kent, in England, to Mascot aerodrome, Sydney, Australia, and on to Blenheim, New Zealand, and returned to Croydon, London, a total distance of 26,450 miles (42,567km) in 10 days, 221 hours, 22 minutes. The outward journey of 13,179 miles took 104 hours, 20 minutes, and the return journey 140 hours, 12 minutes. To mark Australia’s 150th anniversary of European settlement, their Comet was rechristened “Australian Anniversary” for the record-breaking occasion. The Comet, a classic of the Golden Age of long distance air racing in the 1930s, was a twin-engined British 200mph racer specifically designed to win the 1934 MacRobertson Air Race, from Mildenhall in England to Flemington racecourse in Melbourne, Australia. The race was held to mark the centenary of Melbourne. A prize fund of $75,000 was put up by Sir Macpherson Robertson, an Australian confectionery manufacturer. De Havilland answered the challenge when it appeared no British-made plane would be competitive in the race. Only three Comets were ever made, each sold for £5000. The airframe consisted of a wooden skeleton clad with spruce plywood and a fabric covering on the wings. A long streamlined nose held the main fuel tanks, with the low-set central two-seat cockpit forming an unbroken line to the tail. The engines were Gipsy series II with a higher compression ratio. The scarlet “Australian Anniversary” – G-ACSS - was originally called “Grosvenor House” (it has since been restored and has reverted to that name). It was bought by a A.O. ("Tony") Edwards and named after the ritzy Park Lane, Mayfair, London hotel he owned. 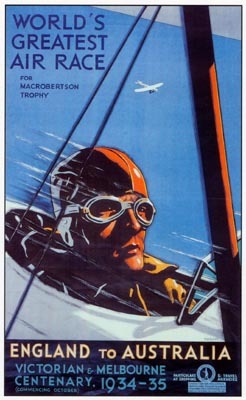 It first set a record in October 1934 when Charles Scott and Tom Campbell Black won the MacRobertson Trophy by flying from England to Melbourne (11,000 miles) in 70 hours, 55 minutes. 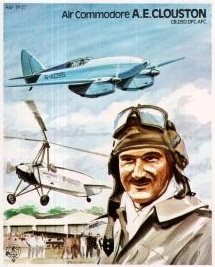 Grosvenor House was fourth in the 1937 Marseilles-Damascus-Paris race, and in November that same year Clouston and a Mrs Betty Kirby-Green flew from London to the Cape of Hope Good, South Africa (7091 miles), in 45 hours, 6 minutes, returning in 57 hours, 23 minutes, the combined time a new record. 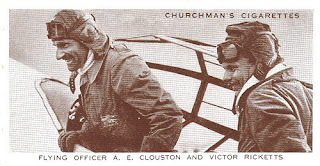 Clouston and Ricketts first attempted to fly to Australia in February 1938 but undercarriage problems in Cyprus ended the attempt. In the successful attempt, a month later, Clouston and Ricketts reached Sydney in three days, nine hours. 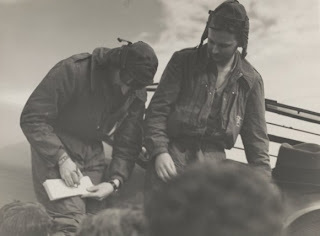 The next day they continued on to New Zealand, making the Tasman Sea crossing in a record seven hours, 27 minutes, arriving on March 20 at Omaka Airfield, Blenheim, where Clouston had learnt to fly. The following day the return flight took eight hours 31 minutes. Clouston was born at Motueka, on New Zealand’s Golden Bay, in 1908, and joined the Royal Air Force in 1930. He was also a test pilot for the RAF’s famous Spitfire fighter plane, which eventually turned the Battle of Britain. Indeed, Clouston and Ricketts both flew in the Battle of Britain, with Ricketts being killed in action in July 1942, aged 29. He was born in Penzance on January 27, 1913. In March 1942 Ricketts was detailed to photograph the Renault works near Paris, which had been attacked the previous night. Despite bad weather, low cloud and poor visibility, he succeeded in obtaining valuable pictures. For this operation he was awarded the Distinguished Flying Cross. 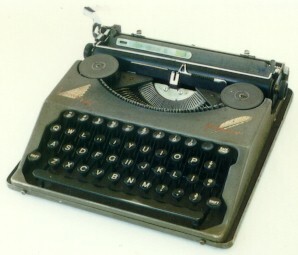 Ricketts failed to return from a photographic sortie to Strasbourg and Ingolstadt on July 12, 1942. He is buried in the Canadian War Cemetery near Calais. Clouston died on January 1, 1984. What a great story! And what a coincidence you feature the British Hermes Baby off-spring, when I just reported on the Italian ala ( http://sommeregger.blogspot.com/2011/04/ala-one-more-wing-found.html ). The typosphere is connected by aetherian waves. Enjoyed reading your post. 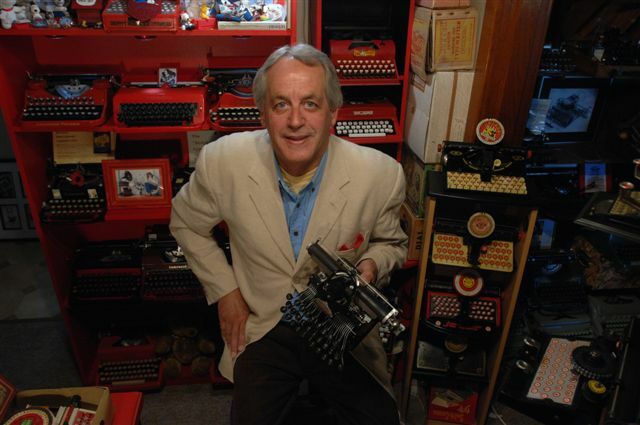 History wrapped around a typewriter. I'm following you to make sure I don't miss any posts. Victor Anthony Ricketts was my father. I still have this particular typewriter. Hello - this is a fascinating story. My wife's uncle was related to one of the men who helped finance the trip - namely Edward MacAlpine from Consolidated Press. 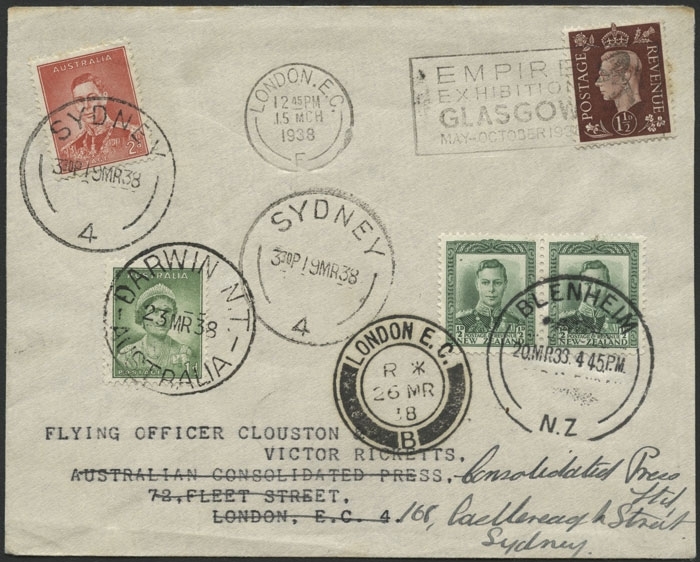 He was UK based but eventually became the Editor-in-Chief of Australian Consolidate Press in Sydney. We have some photos and other information from the trip. Question - is there any other material out there regarding the story of the trip - how it was set up and managed and some of the details of the journey itself?